The Handbook presents principles which form the foundation of the profession and incorporates a set of spinal and peripheral regional chapters which detail functional anatomy, the injuries common to those regions, and evidence-based assessment and management approaches. Its design incorporates numerous photographs, figures, tables, practitioner tips and detailed sample Patient Record Forms. 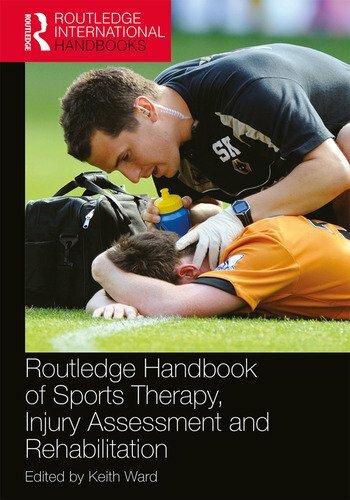 This book is comprehensively referenced and multi-authored, and is essential to anyone involved in sports therapy, from their first year as an undergraduate, to those currently in professional practice. Keith Ward has practised as a Sports Therapist since 1995. He has taught at a number of colleges and universities, and since 2009 has been a full-time lecturer on the BSc Sports Therapy programme at University College Birmingham (UCB), UK. He runs a small private practice in Cannock, Staffordshire. His first book, Hands-On Sports Therapy, proved popular with students of sports therapy and became a recommended text for many courses. Since 2012, he has been Managing Editor of the Journal of Sports Therapy (‘the JST’). He is a member of the Society of Sports Therapists (SST), a member of the Register of Exercise Professionals (REPS), a Fellow of the Royal Society of Public Health (RSPH), and a Fellow of the Higher Education Academy (HEA). Keith holds a biomedical BSc Rehabilitation Studies degree and Diplomas in Sports Therapy, Sports Massage, Exercise Referral, Naturopathy, and Acupuncture. He is currently completing an MA in Learning and Teaching.